Get high efficiency air filtration and great versatility in a highly portable package. The DefendAir HEPA 500 combines advanced air scrubbing performance with the features and functions that help to make the restorer’s job easier, faster, and more profitable. The DefendAir HEPA 500 uses HEPA filter media with an efficiency rating of 99.97% against 0.3-micron oily aerosol particles. When used with the DOP 2nd stage filter, the HEPA 500 meets first-pass filtration requirements for sensitive jobs. The optional Activated Carbon Filter allows users to quickly and effectively attack smoke and other noxious odors in the environment. See all HEPA 500 filtration options here. 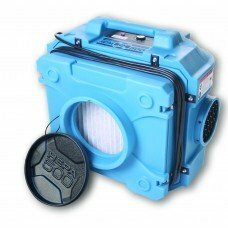 The HEPA 500 is ideal for handling indoor air quality needs on every restoration job. Restoration that involves sewage, mold, or fire damage involves significant amounts of particulates and bad-smelling gasses – a direct result of the damage itself. In a water damage restoration environment, the high-velocity airflow needed for drying can stir up particulates that have settled in carpet or on other materials. The HEPA 500 addresses these air-quality issues quickly and effectively, helping you to maintain a clean, odor-free indoor environment for your technicians – and your customers. Daisy chain Plug up to four units together for a total of 2000 CFM on a single 15 amp circuit.